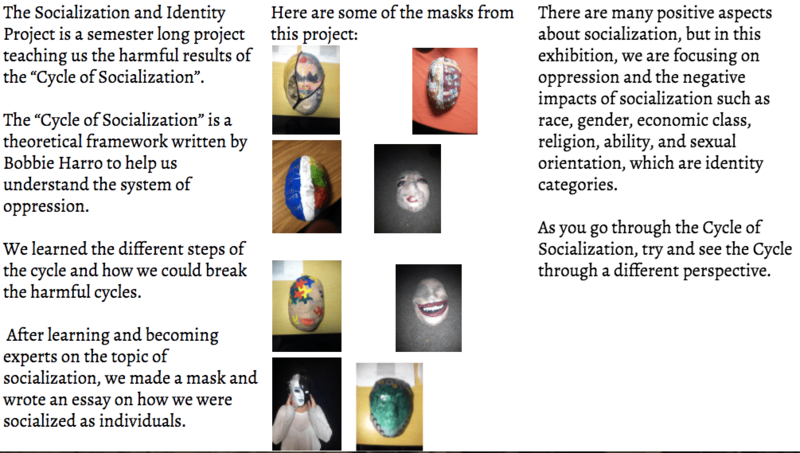 Project Description: The Socialization and Mask Project was to teach us about the impacts that socialization has on our society. This was a 14 week project. We started by learning the content about socialization. We made posters, took notes, and learned about socialization in our society. After that, we started writing our essays, making our masks, and reading the book "Mexican White Boy." 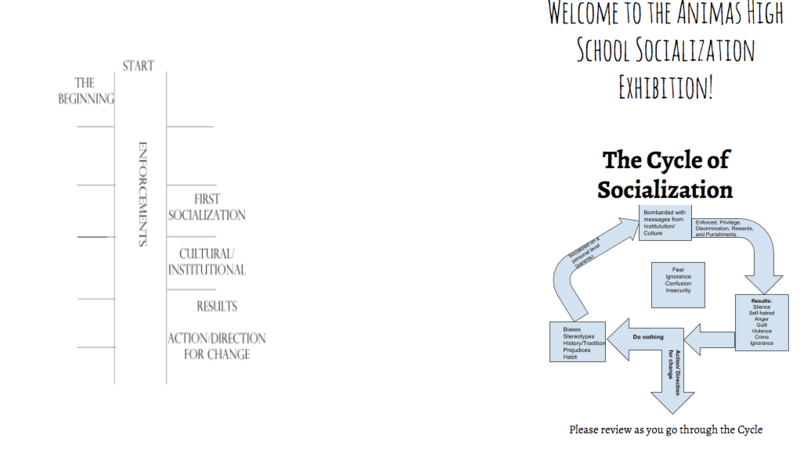 In the Socialization Essay, we picked two-three identity categories that were personally intriguing to us. We learned about TEA paragraphs and "setting up quotes." We used different types of evidence to backup our points. We also made masks out of plaster. This was a long process, but a fun one. We got to have someone plaster our face, and then we got to decorate the mask in a way that showed our understanding of socialization. "Mexican White Boy" is a book about a boy, Danny, who spends the summer living in a very different way than he was socialized. He struggles to fit in, but finds common ground with Uno; the other main character. They both are very good baseball players. Uno is African-American, who also struggles to fit in. When his dad offers for him to move and live a better life, Uno steps up and begins reaching his father's requirements. At the end of this project, we had a very interactive exhibition. The way we planned it was coming up with prototypes of our ideas for the exhibtion. We then voted and constructed the exhibition. Finally, our exhibition and final product was finished. Mask #1: Happy, standards of women in today's society. Mask #2: Sad, what women are called if these standards are not reached. Music notes to show that music is an escape. How I grew as a writer in this project: I feel that I grew a lot as a writer in this project. Writing the essay was challenging, but when I finished, I was very proud of my work. The place that I grew the most in my essay was in my conclusion: “Today, I am told that a man can call me his. That I am vulnerable, and to not go out alone. Because of other women, who have been taken, raped, murdered by men who think that we are a possession. An object. And because of my age, I am the most vulnerable. Most likely to not think and to believe these things. Woman who try to speak out are not heard and not taken seriously.” I felt very passionate when writing this, so I made it my best work. I believe that the content that I put in my essay was very strong. Largest Take-Aways: After this project, looking at random, everyday things shock me. It was the content about gender roles and my essay that had the biggest impact on me. Doing research for the essay was very interesting to me. “Reduction of the body is the treatment of a person as identified with their body or body part. Some men see women as objects. An object doesn’t have a personality. A woman does.” As I watch TV, or just scrolling through social media, I see men treating women as if their animals, rewarding them when they’re doing good things, and punishing them if they aren’t reaching the “standards.” While doing research, I discovered that this is major problem in our world. My Goals as a Group Worker: A weakness that I had when working on this project was flexibility. To me, this means making sure everything works if something fails. I like having a set plan and sticking to it. A goal that I had was to “have a backup plan just in case my original plan fails.” I feel that I reached this goal in some areas and I could’ve improved in other areas. I was on the exhibition crew for our project. When we were working on the parking for the exhibition, we had to have a backup plan. When we asked if we could use a shuttle, we were told that they couldn’t tell us until the last minute, so we had a different parking plan just in case. A time I feel that I didn’t have a backup plan was when we were setting up to play music at the exhibition. We were setting up, when someone told us that there wasn’t enough room, so I panicked. Because everyone else was so flexible, we were able to move the entrance and waiting area. I feel that I can still work on being flexible in projects like this one. Contribution to the Success of the Exhibition: Although my group didn’t build a room, I feel that we contributed a lot to the exhibition. I made signs for three of the rooms, and I made brochures that included a map of the exhibition, pictures of masks, a description of the project, what we were focusing on in the exhibition, and a map of the cycle of socialization. I feel that I also contributed by playing music. I put a lot of effort into making these things happen. I believe that my effort in putting this project together.